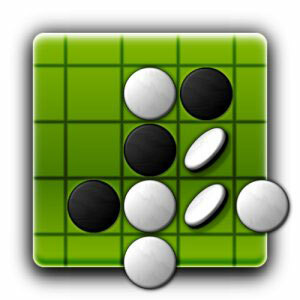 AI Factory's Reversi brings the classic board game to your Android phone. Reversi sports a clean and intuitive interface, features 10 levels of difficulty, and provides an Undo button if you want to make a different move. Play against the AI or a human opponent. Reversi is played on an 8x8 grid. The game begins with four tokens: two light tokens for the first opponent and two dark tokens for the second opponent. The tokens are placed next to each other at the center of the board. You must place your token so that two of your tokens are on two sides of your opponent's single token or line of tokens. The tokens between your two tokens are then flipped over to your color. Conversely, your opponent flips your tokens to his color in the same manner. The object of the game, of course, is to end up with more tokens by the time game board is filled up. Reversi, much like chess and go, is a duel of cunning strategy and cold logic. The corners and edges of the board are crucial to the game. You should do your best not to give up these positions. This Reversi app comes loaded with options. Choose from two different boards and tokens, and toggle the sound, screen transitions, and legal moves. Get suggestions from the AI on your next move, and keep track of your games against the AI at all 10 levels. Reversi also comes with the full rules.